Whether we’re already accomplished artists or just at the start of our creative journey – one thing is for sure – we’ll all hit the creative block of uncertainty at some point, wondering what we should make next. This can be a frustrating, even incapacitating experience for some; waiting passively for the muse to strike. Sadly there are many harmful myths surrounding creativity as an elusive force that can not be learned. In recent years these laughable notions have been disproven, establishing the fact that we all have a natural capacity for the creation of ideas. This short 48-page book offers a simple 5-step idea-generation methodology that can help you breakthrough your creative barriers using the active application of work ethic. From research to concept right through to inducing the ‘Eureka’ moment. An idea is nothing more than a new combination of old elements. It relies on our ability to see the relationships between these elements. When these relationships are seen, a new application is suggested and a new combination/idea is formed. Systematic research based on the theme of your project – this can be done on a project-by-project basis. For example it could be the investigation of a new technique such as horsehair weaving or looking at a distinct geometric form that has taken your interest. General curiosity about events, life, our experience of the world – this type of gathering goes on throughout our entire lives and informs our world view. These tend to be somewhat broader than specific materials but could be your lifelong love for landscapes or relating to your political interest in women’s issues in the 21st century. It’s important that we go deep on the research stage so Young suggests that each element of research be written and organised on cards (I use the notebook application Evernote – one item per card, classify each by sections of your subject. This keeps you from skipping and also forces your mind to consume the information through writing – a huge help when preparing for the idea-producing process. Time to chew on this sustenance – It’s hard to describe what happens here as it goes on entirely in your head. We’re now seeking the relationship and trying to piece the puzzle together like a jigsaw. When creatives are in this phase they get a reputation for their absent mindedness. Firstly little parts of an idea will come to you – write these down, no matter how crazy, how bad or obvious they are, DO NOT self-censor. These are the suggestions of the real idea. If you write everything down that comes to mind a second thing will happen – you will get tired. Keep on going! The mind has a second wind too. Try to get out one or two more incomplete ideas before you reach a dead end and there’s nowhere else to go. In the third stage you drop it, put it out of your mind and let go. This part is as important and as necessary as the previous two stages. Putting the problem out of your consciousness lets the unconscious be stimulated. When you reach this third stage turn to whatever nourishes your imagination and emotions. Listen to music, go to the theatre, watch a movie, read poetry or take a walk. If stage one is gathering food, stage two is chewing and consuming, stage three is the digestion. If you’ve done the work rigorously in the previous three stages you should experience the next. Out of nowhere an idea will appear – coming when you least expect it – while taking a shower, washing the dishes, brushing your teeth, when you’re half awake or in the middle of the night. This is when ideas arrive, ‘The Eureka moment’ after you’ve put your mind through its paces and have gone through a relaxation period. Now it’s time to take your idea out and into the real world. This is often when you realise this shiny new idea isn’t quite as beautiful as when you first gave birth to it. Unfortunately this is when many good ideas are lost. Your idea needs to adapt and be submitted to criticism. Good ideas have self-expanding qualities that stimulate those who see it, even adding to possibilities that you may have overlooked. 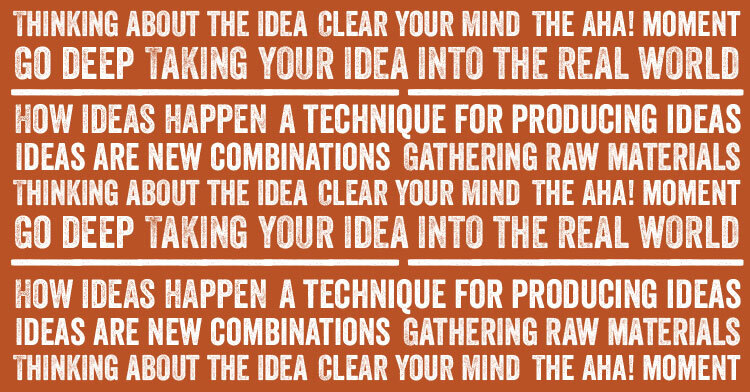 Have you used this technique for producing ideas or do you have your own methods? Please share your processes by leaving a comment below. I’ve never thought about this in terms of steps but this is how I work. Sometimes though I spend a lot of time in steps 1 and 2 and never reach 3 – 5. I work in a very similar way too! Im not so good at steps 5/6.Fascinating they way us creatives work eh? What an inspiring and informative read! Can’t wait to get back to my studio! Thanks for sharing. So simple a process when thought through, so complicated when experiencing it. Really insightful thinking has gone into distilling the process and formulating it. Thankyou. Ideas don’t come from nowhere. Feed your mind with images, photographs, textures, fabrics and colour. Allow yourself to be obsessed with the subject you have in mind and generate lots of ideas then the materials and ideas will gel. Fiddle with your materials create a “heap of stuff”. Then refine and simplify your idea.